You have seen them on the ice - now you get to see them behind the desk right here in Pittsburgh. 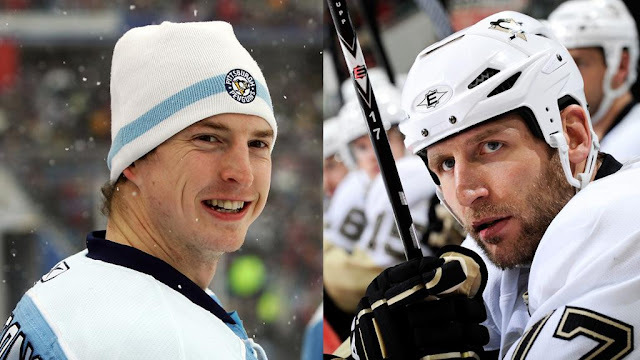 Root Sports announced this morning that they have hired former Penguins Colby Armstrong and Mike Rupp as broadcasters for Pens Post Game. They will be adding their analytic talents together with Bob King and Jay Caufield. This move comes as part of an expansion taking place at Root Sports. The new team will be headed up by famed play-by-play announcer, Paul Steigerwald as well as Bob Errey (color commentator) and everyone's favourite face along the "side-lines", Dan Potash. Stan Savran and Robby Incmikoski will also be involved as well and will add their analysis during the post game show as well. Both Armstrong and Rupp found success in the NHL especially here during their time in Pittsburgh. Mike Rupp has been around just about as long. He was drafted by the New York Rangers and won the Stanley Cup in 2003 with the New Jersey Devils. A few years later he would join the Penguins and remain with the team from 2009-2011, winning yet another Stanley Cup. Before retiring he would go on to play in 610 NHL games over 11 seasons. Rupp and Armstrong are no strangers to television. Both of these former players have broadcasting responsibilities elsewhere throughout the season. Armstrong is a broadcaster in his native Canada on Rogers Sportsnet. Rupp has a gig here in the States with NHL Network. Both of them, however, now call the Pittsburgh area home. We wish them good luck in their new endeavour and look forward to seeing both their faces when the regular season kicks off in just one week.